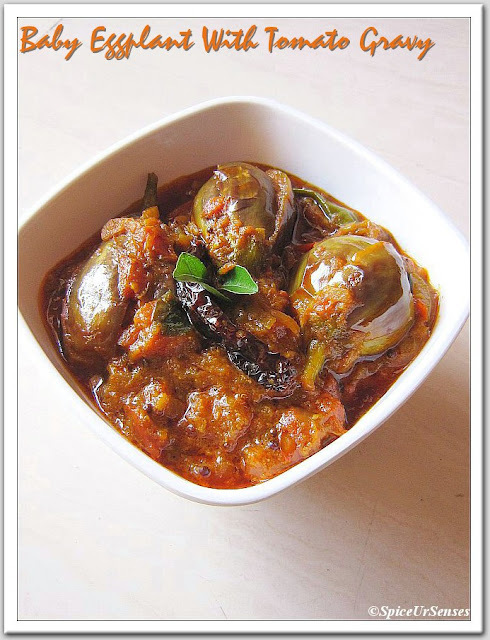 Bagara Baingan With Tomato Gravy.. They are many ways to cook this bagara baingan recipe, this is very famous in Hyderabad but they add peanuts and cashew nuts paste. Few days back i was watching one serial on sony tv, there she serves this bargara baingan to her family. She did not tell the recipe :) but it was looking very taste to my eyes. On the same time i told my self i should make this dish at any cost. To give a twist i made it without peanuts and cashew paste, it was tasted like bharta with whole baingan and it was going very well with Roti. In a deep frying pan add 1tbsp of oil and fry the eggplant with little salt for 2 to 3 minutes and keep it aside. In a same cooking pan , add rest of the oil, when oil is hot, add curry leaves, mustard seeds, and dry red chillie. when they splutter. Add onion and green chillies, fry to golden brown, then add all the masala powder and ginger garlic paste, fry till oil separate from masala, then add chopped tomato's and tamarind paste and cook till they are soft , keep smashing tomatos in between. 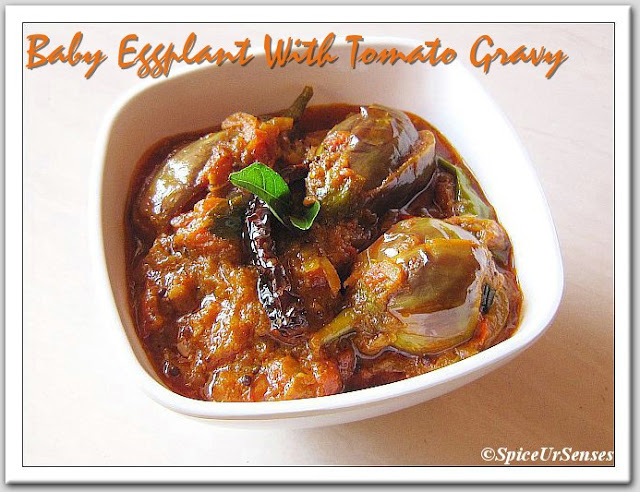 Now add eggplant and salt mix well, then add 1 cup of water, mix it again and cook till the eggplants are cooked well. Serve hot with Plain Rice or Roti's. This is one of my fav diah... Thanks. 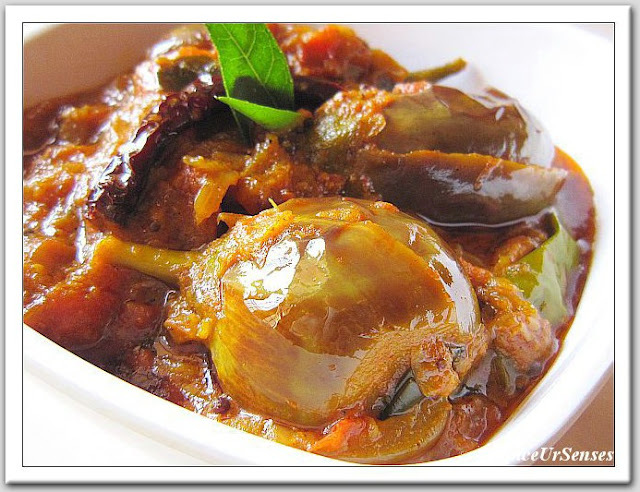 Lavish and mouthwatering Eggplant curry. Never tried this method. Loved the way you have prepared it. Thanks dear.. Sure i will see.. Such a rich, delicious gravy.. looks awesome!! looks so healthy & delicious...mouthwatering! looks very nice and colourful.